I was struggling to take screen shots. I noticed that the exhaust on my cynabal was a bit cooler. I'd struggled earlier in the day to take a screenshot. There are options such as googling the answer or asking someone. That all seemed ridiculous when I can hit my keyboard randomly and see what happens. I am the proud owner of one screen shot. 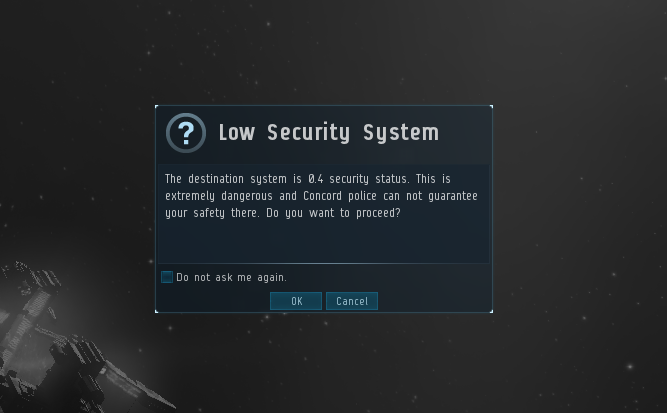 I decided to venture and pick up some stuff from low sec just because. I was super proud of myself until I forgot what I was doing and wandered away from my computer while I was in high sec. I came back alive but I laughed that my survival instincts seem to not be operational. On the flip side, my lawn got mowed. There is also my useless bookmarks. As I warped to a pounce I had under a station I pondered the existence of the station above me. I wasn't undocking when the newer, bigger grids came into play. I now remember a thought somewhere in the back of my brain that I'd have to change my bookmarks. As that I was not undocking at the time, I didn't worry about it. Now, I face an interesting change. I also found the 'add to queue' button under the ship skills. I find it very giggle worthy that it added to the end of my skill list. Some 124 days in the future. Under the ESC menu / Shortcuts tab, you will find a dense array of key combinations to do things in EVE. It keeps growing; new ones to control carrier fighters were added not long ago.